How do you know you’re listening to Mozart? He wrote stunning melodies, often with lots and lots of notes. When Mozart lived in Salzburg, the emperor is said to have remarked of his music: "Too beautiful for our ears, my dear Mozart, and vastly too many notes!" Mozart supposedly replied, "Just as many as are necessary, your majesty!" Mozart sought out stories for the music he already wished to write, believing "in an opera the poetry must at all costs be the obedient daughter of the music." A portrait of Mozart painted posthumously by Barbara Krafft, 1819. Two young men are boasting about their lover's fidelity, but the cynical old bachelor Don Alfonso scoffs at their certainty. Determined to prove him wrong, the pair dress up as Albanians and attempt to seduce the other’s lover. Their young fiancées are amused, then intrigued — they are bright young women in love with love itself. Temptations and trickery put both relationships to the test. Will anyone’s love remain unchanged? 'Soave sia il vento'. Fiordiligi and Dorabella wish their fiancé safe passage as they travel off to war in this beautiful trio with Don Alfonso. 'Soave sia il vento' is the soundtrack to desire in several films. It is a recurring motif throughout the 1971 film Sunday, Bloody Sunday, a moving backdrop to a kiss in A Home at the End of the World (2004) and a perfect soundtrack to seduction in Closer (2004). Throughout the opera, Mozart uses the orchestra to paint a soundscape for Naples: listen out for the clarinet's lingering, languid melodies, evoking a lazy, seaside, summer afternoon. At the start of the famous trio 'Soave sia il vento', the strings ripple through the first few bars, imitating the sea on which Ferrando and Guglielmo must soon travel. Fiordiligi's showstopping aria 'Come scoglio immoto resta' is a lesson in musical irony: as the soprano sings of her steadfast fidelity ("like a rock we stand immobile against the wind and storm, are always strong in trust and love"), the melody line leaps and falls in huge bounds, never settling comfortably, ever unsteady! Even critics of the shallow libretto cannot help but agree that Mozart used it to create some of his best music. He captures the comedy on the surface without ever letting go of the heartbreak which might lie beneath, when a joke goes too far and love is really on the line. Some of Mozart's most stunning music in this opera occurs at moments where the audience is feeling most cynical about the emotions depicted in the story. What beauty he creates in parody! ... a ravishing new version of one of Mozart's most popular works and the final of director Sir David McVicar's trilogy of Mozart and da Ponte operas. Designer Moritz Junge draws on the beautiful fashions of 1900s Italy, in the tradition of A Room with a View, or Death in Venice. Emperor Joseph II was dying of tuberculosis when he supposedly commissioned Mozart and da Ponte to write an opera about an amusing incident which had recently scandalised Vienna. This anecdote may or may not be true — it's certainly a good story — but the libretto is one of just two da Ponte created without using a source text, so it is possible! 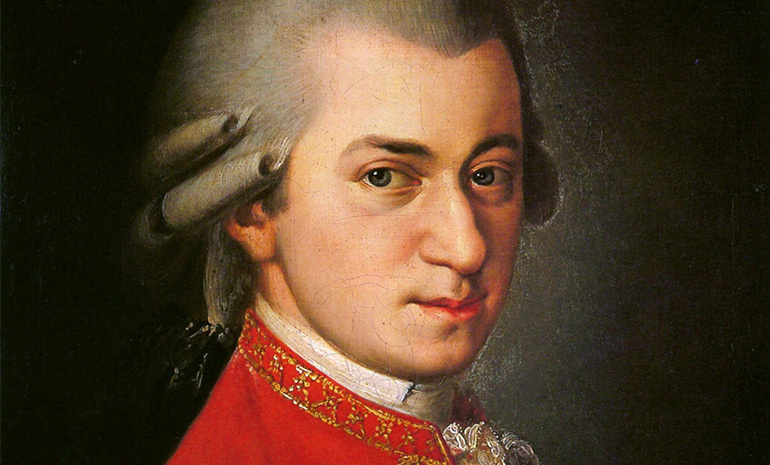 However it came about, Mozart began writing the opera in 1789 and a year later, it premiered in Vienna. The Burgtheater performed it five times before the Emperor died and the city went into official mourning, closing all of the theatres. This gave the opera a slow start, and the scandalous subject matter (fiance-swapping! Infidelity!) and perhaps too-relatable emotions made it a rare treat in Europe for nearly two centuries. After World War II, the opera rose in popularity around the world, and comes in at number 11 on the charts of most performed operas around the world. 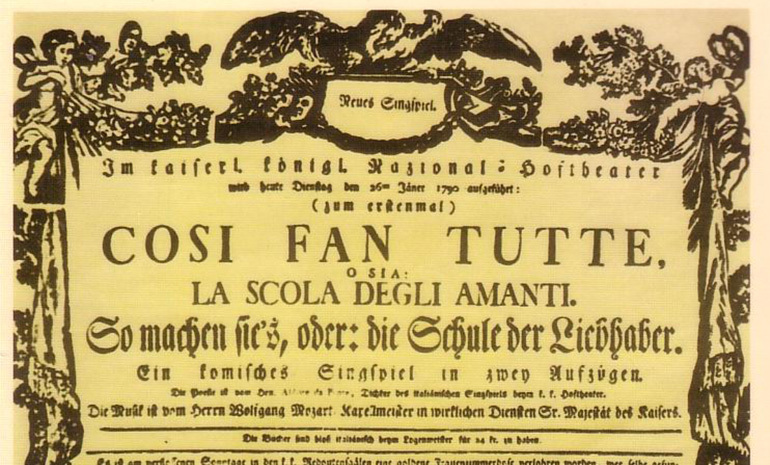 The playbill of the first performance of Così fan tutte, performed at the Burgtheater in Vienna on 26 January, 1790. Mozart reportedly hated da Ponte's mistress, the soprano who created the role of Fiordiligi. He filled her showpiece aria with big leaps from low to high notes and back again in order to make her head 'bob like a chicken' on stage. Critics don't know what to make of Così fan tutte. Is it a ridiculous story, upon which Mozart wasted his genius? Or is the seeming tension between the story and music evidence of Mozart and da Ponte's brilliance, where clever writing and stunning music lends depth to an at-first-glance lightweight tale? A good director and designer can play with this unease to great effect if they avoid the temptation to reduce the story to buffoonery or neglect the comedy for the profound truths about human emotions that lies underneath. The composer: Mozart. Austrian. 18th century. A child genius, he wrote more than 600 works before his death at 35. The music: sensuous, harmonious, stunning! The opera contains some of Mozart's most beautiful music. The setting: McVicar has set this story in the early 1900s in Naples. The history: The story is supposedly based on real-life events that had been the scandal of Vienna at the time! A quirky fact to impress your date: Mozart reportedly wrote the leaps and bounds of Fiordiligi's showstopping aria to make her head 'bob like a chicken', as he didn't like the soprano set to play the role.